“We (slight pause) are a nation divided.” declares an authoritative male voice, while the television screen fills with black and white images of swarms of people confronting each other in the street. “That’s what they tell us, right?” the voice continues as sirens punctuate the muffled sounds coming from a large agitated crowd. I watch this ad feeling hopeful as I see everyday people marching for peace and justice. It’s obviously an ad, but for what? This swell of humanity striving for a better world fills me with inspiration. It emboldens me to work harder to create a more just and equitable world. What’s it advertising or is it a PSA for the ACLU, Amnesty International…? I stop wondering for a moment about the product, because I’m swept up in pride at the American tradition of unity, generosity and helping those in need. Now I’m hopeful that we Americans, can come together, rise above our differences to make this country and world a better place. OMG, they’re advertising a car! Not just any car but a Cadillac. The gas guzzling behemoth that contributes to global climate change with its low gas mileage (22 city/31 highway). Cadillac, whose parent company General Motors, historically achieved greatness when the EPA named it one of the top 100 corporate polluters. Cad-il-lac! A status symbol. A car for the elite, not for the masses. A Caddy – unaffordable by most, envied by many. I spent 34 precious seconds feeling good about the world, about our country. The longest I’ve felt since the Women’s March. Now I only feel anger. Anger at these advertisers’ emotional manipulation for a product that contributes to global climate change. Anger at this ad built on the backs of heroes and change agents. Talk about feeling ripped off. Robbed. Cheated. Used. Duped. Maybe I feel worse because I identify with these images, with these movements or because they’re usurping these social change movements, for which they’ve never played a part and even thwarted, to sell something that contributes to our planetary demise. I feel duped by allowing myself to feel manipulated by their images and rhetoric that feel sacred to me. A labor organizer colleague disagreed with me about this ad, which aired during the Academy Awards, because he said their UAW workers receive a good wage, which, of course, is important. Had the ad come from the UAW, I would have hailed it, because they’ve fought the good fight for workers. Had the ad featured electric cars, which I see as working towards a solution, I too would have lauded it. Just not a Cadillac. Of course, they’re not the first company to play on our emotions. That’s advertising’s design. It manipulates us. Opens our heart to see the product or service for the first time or in a new light and then, hopefully tells our brain to purchase it. Studies show the average number of advertisement and brand exposures we experience per day per person reaches 5,000+. As much as I dislike hearing the songs I love used for commercial purposes, these artists made a financial agreement with these companies knowing how they would use their art. The Cadillac ad strikes me differently. Because it relies on our emotional connection to striving for a better world to sell us a product for which it bears no connection or relationship. Pure and simple pandering. Well done. But pandering nonetheless. When it comes to ads like this, I must protest. Every year, my father’s family business, General Plating, bought a new car for one of the owners: my uncle, my dad or my grandmother. My parents also needed a second car. This one my parents bought used. 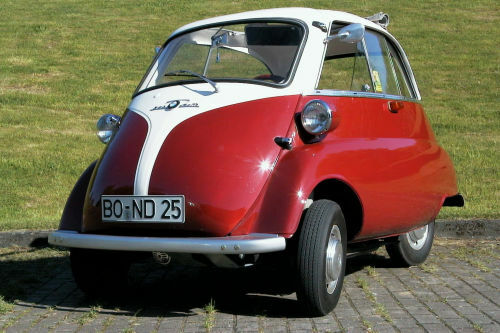 The best second car my father bought, the Isetta, arrived when I was very young, in the mid ‘50s. This Italian designed, single cylinder, one door, two-seater, egg shaped car, painted fire engine red measured 7.5 feet long by 4.5 feet wide. My father entered the car by swinging open the hinged door in the front, which housed the steering wheel and instrument panel. Climbing through the canvas roof provided the only emergency exit. He proudly drove the car home to show my mother. “It’s kind of small,” said my mother hesitatingly as she circumnavigated it in a few seconds. “It looked bigger in the guy’s garage,” admitted my father. My father enjoyed the attention he received when people commented on the car. He loved its uniqueness. But not its frustrations. “Hey Alice, I need to take your car tomorrow,” said my father as he hung up his coat in the hall closet. “What’s the matter with yours this time?” asked my mother while folding laundry in the den. Eventually my father found a mechanic literate in Italian. But the mechanic needed a part to fix the car. A part only available in Italy. My mother shook her head as she tore lettuce into a salad bowl for dinner. She always thought the little “bubble car,” named for its bubble shaped windows, was dangerous and unreliable. Reliably however, it wouldn’t start on cold dark winter mornings. Some days it would start, go less than a mile and conk out. Forcing my father to abandon it on the side of the road and take the bus. 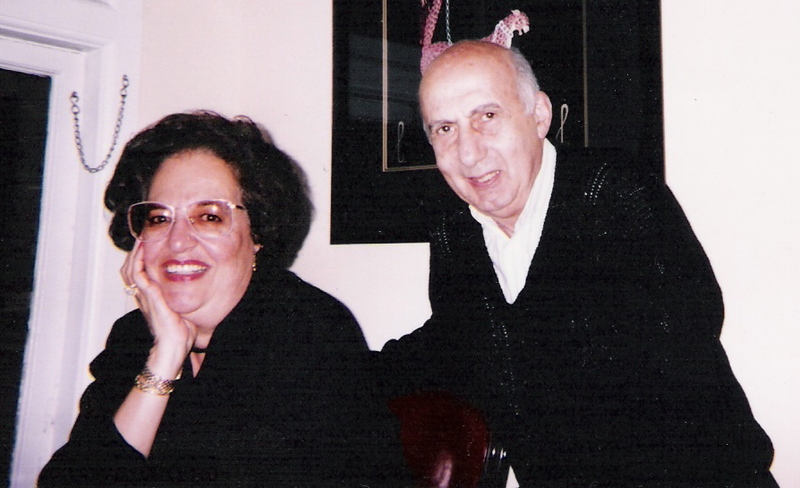 On one such cold February morning, my father called on my mother to help. My mother stood at the kitchen sink shivered and grimaced. “Now?” she asked looking at the clock marking 7:30. “I’m not dressed.” She pointed to her robe and slippers. My mother pulled her big blanket-warm blue winter coat out of the living room closet; summoned my sister and I who weren’t school age yet into the living room and instructed us to sit on the two chairs facing the big window and not move till she returned. We climbed up on the chairs and kneeled to look out. “Sit right here and don’t move so I can see you. I have to help your father with that crazy car of his,” she shook her head as she left the house. My father managed to back the car out of the driveway, cross our narrow street, position it in the church parking lot facing our house. She backed her car out of the driveway. Following his directions she pulled in front of his car. She blew on her hands to keep them warm. Her bare legs remained cold. He yanked a grey rope from the back seat of the Isetta, removed his warm gloves, tied a bowline to his car’s front axle and tied the other end to the station wagon’s rear axle. He directed my mother who wasn’t familiar with the fine points of car towing. “Rev up the engine. Go three miles and hour. Tap the gas. Don’t hit the brake,” yelled my father from the Isetta. “Too many instructions,” she thought but she complied. The car didn’t start. She could see him in the rearview mirror waving his arms frantically. His mouth moving but she couldn’t hear him. She knew she wasn’t doing anything right. And she knew he was mad. So she stopped looking in the rearview mirror. But she kept driving hoping his engine would start and she could stop. My sister and I watched transfixed as my parents slowly drove around in circles.